While the South Central Pennsylvania region isn’t as prone to hurricanes or tornadoes as other parts of the country, we still experience our fair share of significant wind events. Strong winds often accompany the severe storms that sometimes rock the area — and frequently cause considerable damage. 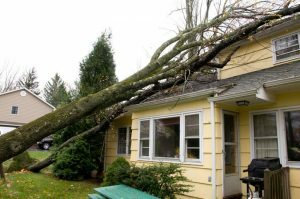 If you’re a homeowner in or near cities such as Chambersburg, PA, Shippensburg, PA or Carlisle, PA, the damage resulting from a windstorm can be extensive — even catastrophic. Headquartered in Carlisle, PA, Tuckey Restoration is ideally positioned to deliver a prompt, reliable response in the wake of a wind event. Our team consists of experienced wind damage repair professionals who will work hard to return your property to its pre-loss condition. We’re part of the Tuckey family of companies that has been providing premium contracting services throughout the region since 1968. You can trust us to respond quickly to your wind emergency. When it comes to wind damage repair work, not all contractors provide the same level of service. Some companies offer only emergency mitigation services to tarp your roof or otherwise stabilize your building after wind damage has occurred. Other companies offer only reconstruction or roofing services that take place only after emergency mitigation has occurred. At Tuckey, we’re full-service restoration contractors that will take care of both your mitigation and reconstruction requirements, allowing you to work with one contractor (rather than several) throughout your restoration project. Depending on your unique situation, we will handle everything from roof shingle and drywall repairs to removing damaged components from inside or outside your home. We also offer in-house mold remediation services, which may be necessary after wind events accompanied by torrential rainstorms. In many cases, wind damage requires immediate attention, especially when a home is uninhabitable. Our teams are ideally positioned to respond to disasters promptly in Chambersburg, PA, Shippensburg, PA, Carlisle, PA, and throughout South Central Pennsylvania. If your situation is particularly complex, you can also take advantage of additional services such as water damage mitigation, mold remediation, reconstruction and repair services, and more. Whether your wind damage restoration project is straightforward or multi-faceted, Tuckey offers a broad scope of expertise and resources to get your home back to normal as promptly as possible. Learn more about how the industry-best wind damage repair services from Tuckey Restoration can restore your Carlisle, PA, Shippensburg, PA or Chambersburg, PA-area home to its pre-loss condition. Contact us for additional information today. "Mindy and Jared were so professional and explained everything they were doing and why they were doing it. After the job was completed they cleaned everything. Even the lint on the grass."